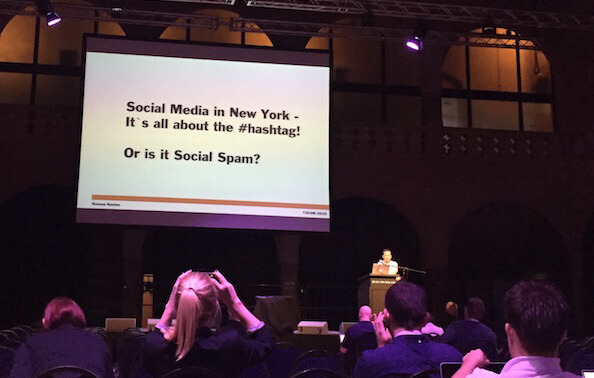 This year’s TYPO3 conference was held in Amsterdam and Usersnap participated for the first time. After two exciting days of talks and great sessions, I’d like to give everyone a peek into the TYPO3 universe. This is not a review of any particular talk or session but more of a personal glimpse into the world of TYPO3. It was our first time to join a global TYPO3 conference, but it didn’t feel that way. Taking place at the Beurs van Berlage in the heart of Amsterdam, the TYPO3 conference and its TYPO3 community made us feel like we’ve been part of it for a long time. With its awesome location and all the super friendly people, I immediately felt like home and knew that this is the place where I will meet like-minded people. After two days at Amsterdam, I can truly say that my first impression was spot-on. Actually, we at Usersnap do have some “TYPO3 connection”. A while back, we developed our own bug tracking extension for TYPO3 which is now used by a wide range of TYPO3 developers and agencies. So technically, this wasn’t our first experience with the TYPO3 crowd. A lot of speakers and topics were focused on the latest TYPO3 versions, especially on the new TYPO3 version 7. To sum it up: Despite all the competition TYPO3 is facing, it is definitely alive. More than ever. Last year, around the same time, it was a bit unclear where TYPO3 was heading into the future. This time, on Day 2 of this year’s T3CON, Matthias Schreiber and Benni Mack showed the audience how the core team sped up TYPO3 development in the last 12 months and what has happened since then. I have to say, it was pretty impressive. The first day – also called the Business Day – covered a lot of business-related topics. There wasn’t that much talk about TYPO3 itself. If I have to come up with three buzzwords to describe the first day, I would probably choose agile, content and development. In the keynote from Alain Veuve, we got a glimpse into the future of the web. The presentation by Robert Weißgräber also covered the topic of agile in project management. It wasn’t the only presentation about agile techniques and workflows though since Sven Ditz, Jürgen Egeling and others also touched on the topic of agile in their talks. Bug Tracking & TYPO3 – a perfect match. We did not join the T3CON15 just to meet all those great and inspiring people. We were actually also part of the program. On Wednesday morning, I presented some insights on how to track bugs. I also discussed the problems of bugs and how to deal with them. Bug Tracking & TYPO3 are definitely a great match. It’s impressive to see how the TYPO3 community tackles the topic of bug tracking. Well, I was quite impressed by the variety of topics covered at the T3CON. For example, I didn’t really expect marketing & business-related topics to be covered much but Rouven Kasten, for example, gave some really good insights on Social Media in New York and on how people and companies in the US are quite ahead of Europe when it comes to social ads.